1.5 hours to hike up, 1 hour waiting for the train, 20 minutes to slide down. Your intrepid photographer's about 320 feet (97 m) above track level, having parked along the road seen in the upper right of the shot. This is train CP 199, Chicago - Vancouver. Power is CP 9835, CP 9675, CP 9724, and CP 9840. Kudos to John Ryan for Photoshop assistance and Mike Bargmann for power info. 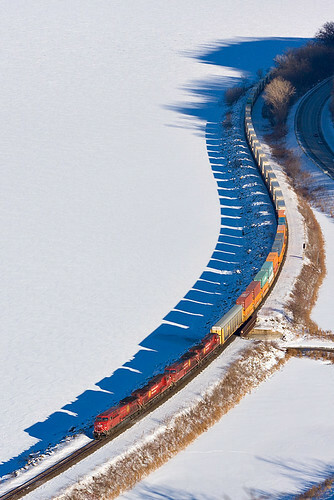 This photo was featured in the February 2011 issue of Trains and the Fall 2013 issue of Bhuddadharma.